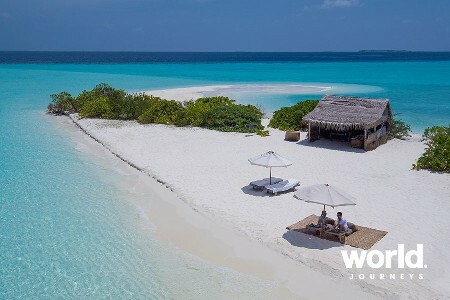 Six Senses Laamu is the only resort in the Laamu Atoll, deep in the Indian Ocean. Just an inter-island plane trip from Male International Airport and a short boat ride brings you to an island paradise where dolphins swim. 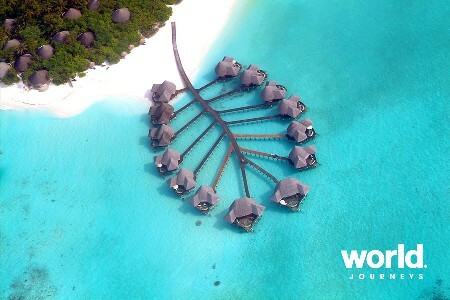 The resort is a combination of on-land and over-water villas constructed of sustainable materials and set around the palm-fringed paradise. 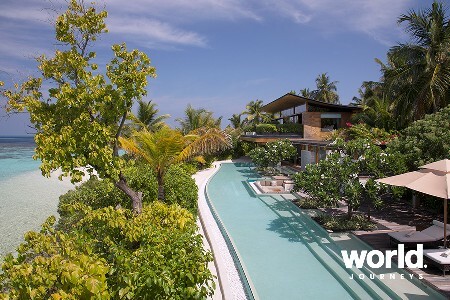 LAGOON BEACH VILLA Located on the beachfront, with a panoramic upper deck and direct beach access. Hidden between the lush tropical vegetation facing the lagoon, these stylishly sustainable Maldives beach villas offer absolute privacy. The beach is only a few meters away and sun loungers are placed strategically for sunshine and shade between the sparkling waters of the lagoon and the hideaway retreat. Feel the soft sea breeze rushing through the leaves while bathing in the open-air branch-encircled shower or in the outdoor bathtub; or you can just relax in the private garden area. 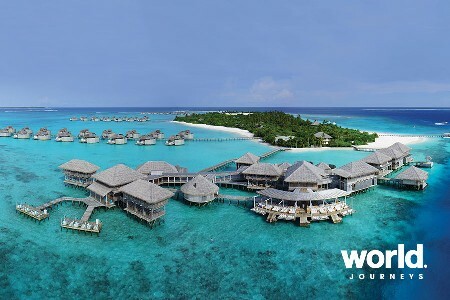 For a unique panoramic view of the Maldivian nature, sapphire seascape and for catching an unforgettable colorful sunset, you can just climb on the treetop deck which features a comfortable seating and dining area. 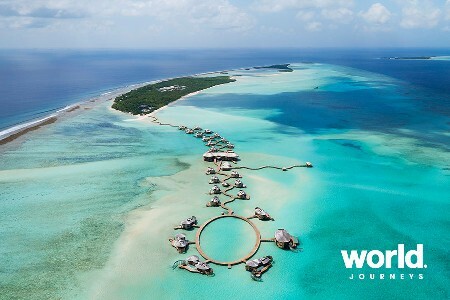 OCEAN WATER VILLA With sunset or sunrise ocean views, the villas offer upper and lower decks plus a glass sunken bathtub. 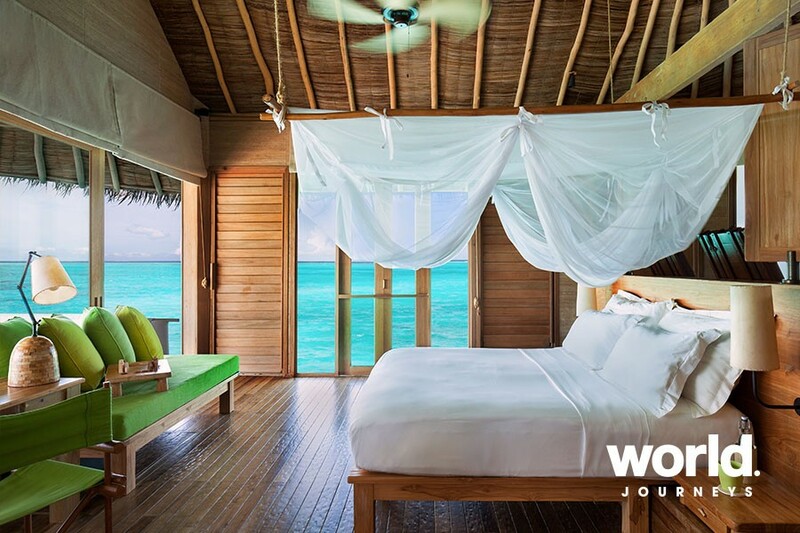 A short bicycle ride on the weathered timber jetties past the lagoon and towards the ocean blue, will lead you to these overwater retreats, secluded by high wooden enclosures. With direct access to the sea, you can jump in for a swim or for a snorkel around the lagoon or relax on the overwater netting hammock. Whether you want to soak up some sun or enjoy the beautiful colors of the ocean during the sunset you can sit back on the sun loungers or around the glass bottom table on the outside deck. 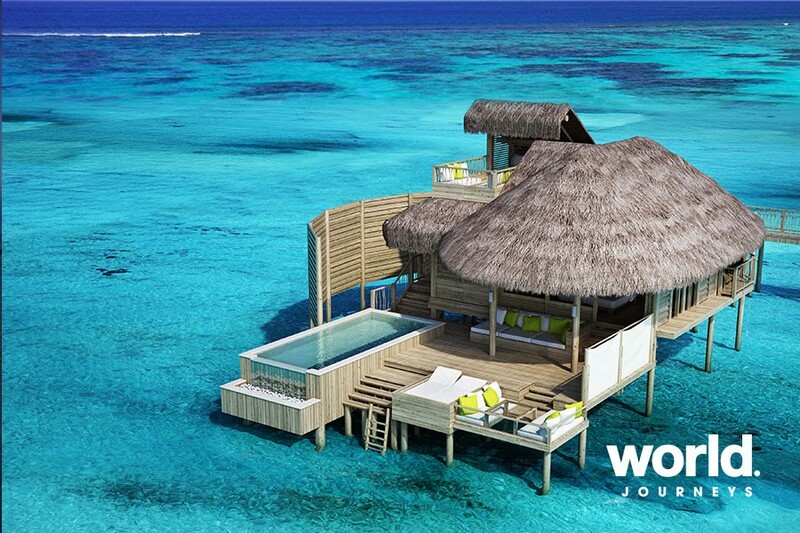 The water villas feature a glass overwater bathtub with a view to the ocean and an outdoor rain shower. For a unique panoramic view of the Indian Ocean, sapphire seascape and for catching an unforgettable colorful equatorial sunset, you can just climb on the treetop deck which features a comfortable seating area. LAGOON BEACH VILLA WITH POOL Set within the forest, and opening to the beautiful lagoon, it is complete with an elevated panorama deck. Hidden between the lush tropical vegetation facing the lagoon, these beach villas with a private pool offer absolute privacy surrounded by the turquoise scenery. The pool is only a few meters away from the beachfront and sun loungers are placed strategically for sunshine and shade by the pool deck. Feel the soft sea breeze rushing through the leaves while bathing in the open-air branch-encircled shower or in the outdoor bathtub; or you can just relax in the private garden area. For a unique panoramic view of the Maldivian nature, sapphire seascape and for catching an unforgettable colorful sunset, you can just climb on the treetop deck which features a comfortable seating and dining area. 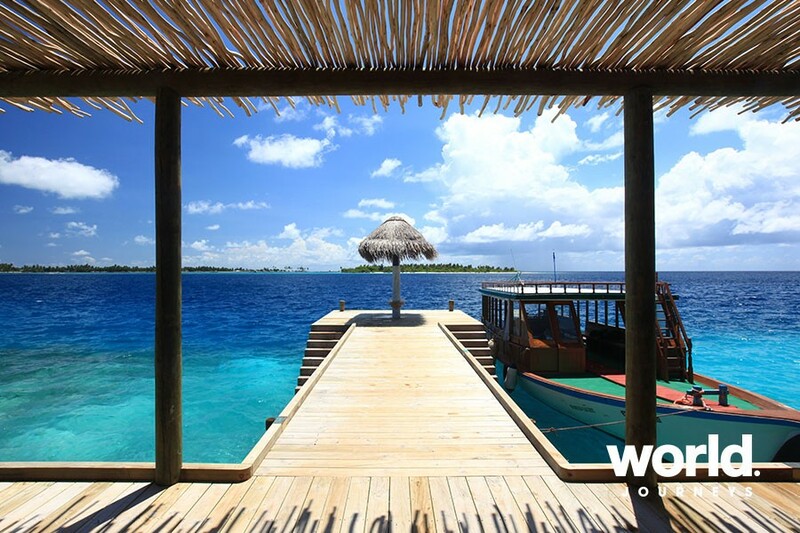 LAAMU WATER VILLA Set towards the end of the jetties, with sunrise or sunset vistas, the villas offer upper and lower decks plus a glass sunken bathtub. 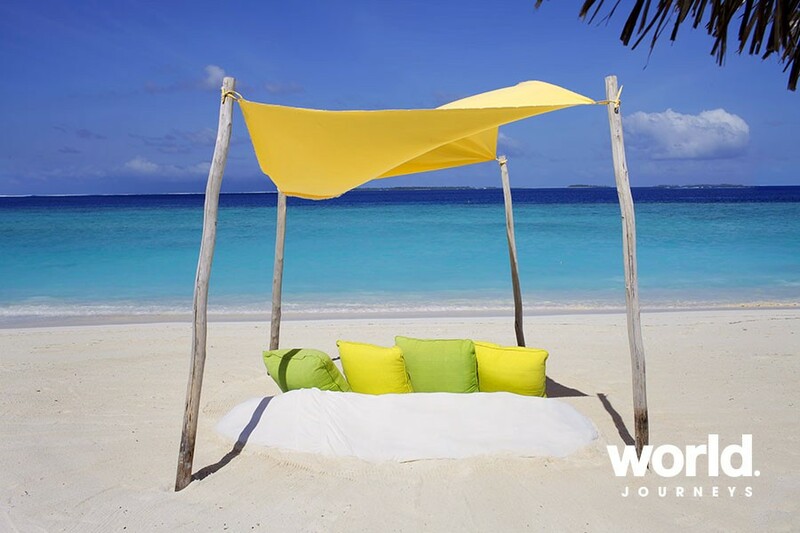 These private hideaways are located further along the weathered timber jetties and offer uninterrupted ocean views. With direct access to the sea, you can jump in for a swim or for a snorkel around the lagoon or relax on the overwater netting hammock. Whether you want to soak up some sun or enjoy the beautiful colors of the ocean during the sunset you can sit back on the sun loungers or around the glass bottom table on the outside deck. 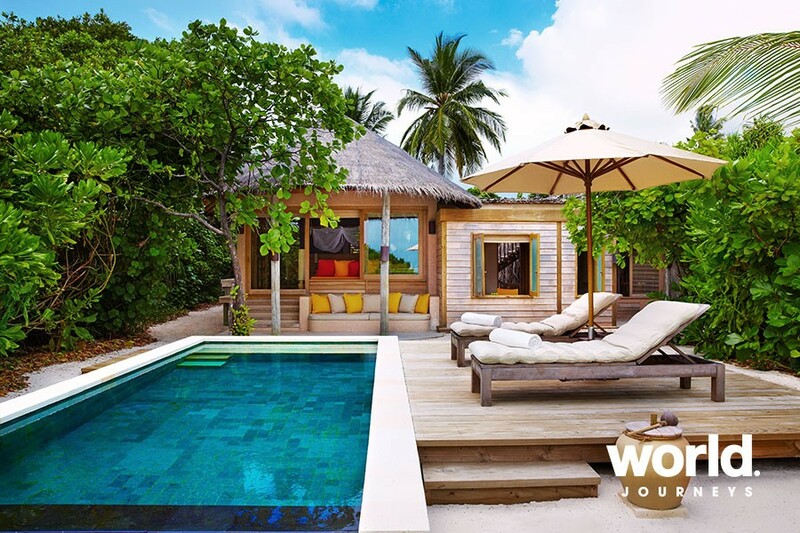 The water villas feature a glass overwater bathtub with a view to the ocean and an outdoor rain shower. For a unique and uninterrupted panoramic view of the Indian Ocean, sapphire seascape and for catching an unforgettable colorful equatorial sunset, you can just climb on the treetop deck which features a comfortable seating area. FAMILY VILLA WITH POOL Beachfront family living, with a panoramic upper deck, personal pool and a treetop deck offering wonderful vistas. 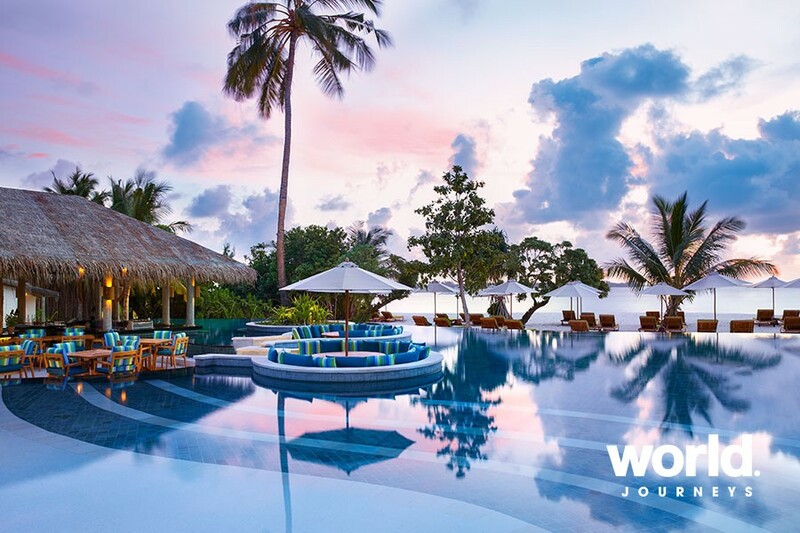 The Family Beach Villas with Pool are hidden between the lush tropical vegetation facing the sea and are ideal for families traveling with children. It comprises a beach villa with the addition of a study which can accommodate up to two children and has an adjoining bathroom. This family hideaway features a private pool and private access to the beach, which is only a few meters away. Sun loungers are placed strategically for sunshine and shade by the pool. The master bedroom is only a few steps away from the children's room and it has complete view of the swimming pool. Feel the soft sea breeze rushing through the leaves while bathing in the open-air branch-encircled shower or in the outdoor bathtub; or you can just relax in the private garden area. For a unique panoramic view of the Maldivian nature, sapphire seascape and for catching an unforgettable colorful sunset, you can just climb on the treetop deck which features a comfortable seating and dining area, suitable for spending some quality time together. 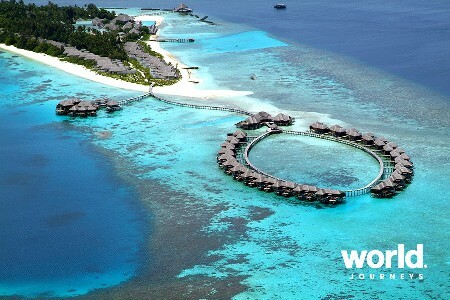 • Tailor-made journey • 5 nights' accommodation • Transfers by seaplane and speedboat • 5 breakfasts. This beautiful resort offers a number of specials, stay / pay deductions, early booking discounts and other benefits. Supplements and special conditions apply over peak periods. Please contact World Journeys for details.